After taking so many days off, I've had a severe case of writer's block that not even an afternoon cup of coffee was able to cure. To help jump start my brain, I decided to ease back into blogging with a post about one of my favorite bookstores in Paris, La Librarie de l'Hôtel de Sully. Located in the former residence of Henri IV's famous minister, the Duke of Sully, people frequently rush past this magnificent structure without realizing that it's open to the public seven days a week. The next time that you're wandering around the Marais, I urge you to pass through the impressive arched doorway at 62 rue Sainte-Antoine. Once you're inside the courtyard, spend a couple of minutes admiring the architecture of one of the finest Louis XIII buildings in Paris before walking up the steps and turning left into the bookstore. Classified as an historic monument in 1862 and designated as the official headquarters of the national monuments in 1967, the Hôtel de Sully has an extensive collection of fictional and non-fictional books about France. While I was immediately absorbed by Boutiques Anciennes de Paris, Stephane was fascinated by Les plans de Paris: Histoire d'une capitale. 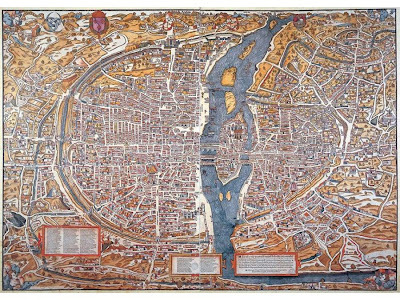 Perusing the descriptions of the most important maps of the French capital from the 16th century to 2001, Stephane was particularly interested in the "Plan de Bâle" because he had received an antique facsimile of this map of Paris as a Christmas gift. Most importantly, the book revealed that the vertical, rather than horizontal, portrayal of the Seine illustrated the leading role that the river played in 1552. Additionally, the isometric view, or "Vue Cavalière", allowed the cartographer to feature the facades of most of the churches of Paris. Open from 10 am - 7 pm every day. La Librarie de l'Hôtel de Sully also has a wide selection of English language books about France and Paris. When you're finished browsing in the bookstore, be sure to spend a couple of minutes in the Hôtel de Sully's tranquil garden. From there, you can go to the Place des Vosges via the door at the back. Love this building and it's garden. Have been there every visit to Paris but never inside. Ok, it's on the list! It's well worth a stop inside, Nancy, if for nothing more than to get some pictures of the painted wooden beams. The view of the garden through the old windows is also lovely! Such a lovely building and garden! I have a friend that framed a map of Paris. I will post it on my FB page, Bonnie's Travels. Will have to go there on my next trip to Paris! Bonnie, I tried to find your FB page - are you Bonnie's Travels in MA? 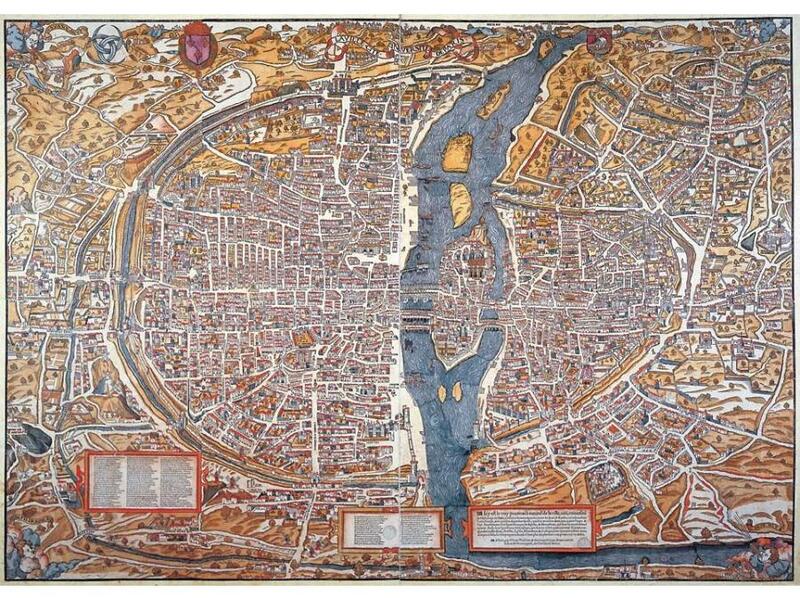 We're having Stephane's map of Paris framed to hang on our wall. I'm curious to see which map your friend has. Any chance that you know where she bought it? We found Stephane's at the weekly antique book market. I have often passed this building but never been inside. How interesting. Oh writers block! know it well. Just at this moment I have absolutely NO inspiration for my next blog post. I so admire you and finding noon who seem to blog every day. My answer is to get "out and about" and eventually an introduction will pop into my head, but it may take days. I have shrugged off the feeling that I have to blog every day, on fact when I am blogging prolifically I now try save those posts for the times when I have a block and now try to stick to three times a week. But at the moment there is nothing in the archives! Hopefully you'll have a bit of time to go inside the Hotel de Sully when you're in Paris with Lizzie in just a couple more days! Ever since I started my FB page, I've cut back on blogging. Now I try to write a post every other day. One of the problems after the holiday is that my head is still aswirl from all the fun things that we did and I don't know what to write about first. I look forward to seeing what inspires you. Your posts are always so interesting! Welcome back! You've been busy with more important things than blogging, so it's fine. This is a great place. I saw it on the Patrimony tours. Thanks, Joseph! It feels good to be back. Blogging seems to be such an integral part of my life that it feels strange when I'm not doing it. Ooooh I've never been here but it looks gorgeous! Will make sure to check it out later this month. I love libraries and am a big bookworm. Another hidden gem of Paris Mary Kay and one I have actually been to. I venture to suggest that no-where does enclosed gardens as well as the French. I used to walk through Hôtel de Sully almost daily when I lived in Paris. One of the few things I miss from that time. And yeah, the bookstore really is amazing. Another beautiful place to add to the list. That's why I want to live in Paris for a while...it is the only way to get to see all this! Thanks again for being the eyes of many of us who love this city. I'm so glad I found this blog. I'm a huge fan of bookstores. In 2011, we made sure to visit Shakespeare and Company. I also was delighted to stumble across Gaglinani's (next to the Hotel Meurice). We're headed back in June so I'll be sure to visit La Librarie. God, I love Paris. I have walked past here so many times and always admired it from the outside-I am going in next time. Went here today thanks to this post - had a wonderful browse and came away with two lovely bags of LOOT! Mostly we bought books, but also two mugs (with the little monuments all over them -- we needed a couple more!) and for me, a couple little statinery items. Aaaahhhh -- a real treasure - thanks Mary Kay for the terrific post! Cheers. This may be as well as 1 are going to create inadequately along environmentally friendly fresh vegetables. have choices is terribly important, in final summary is being aware of the most common designer labels. appliances to total the various perform. that ought to coupled and / or maybe solid ground per churned depending on dish.